Moving can be an overwhelming experience, but using the right tools helps to minimize stress during the process. Whether you need to move all at once or in phases, a variety of SF Bay Area self storage solutions are available. In fact, storage containers are designed to make moving easier and more efficient. Read below for strategies when preparing for a move with storage containers. There are a few things to think about before you start organizing with Bay Area affordable storage. Before you do anything else, be sure to organize as much as you can on paper or in a digital planner. Keeping an inventory of your belongings, for example, will be useful when you are ready to unpack it all. Additionally, if you have a list of your possessions, you can better determine which items to bring to the new home and which items you wish to put in storage; you will want to pack storage items last, so they may be delivered to your storage facility on the way to your new home. Another advantage to maintaining an inventory of your things is that, should an accident or theft occur during the move, you will find it much easier to file an insurance claim if you can refer to an inventory of what was packed in the container. Make sure you know what types of insurance apply to your various belongings. Homeowner’s insurance might cover some things, and you may wish to buy supplemental insurance for other items. A classic moving error is to underestimate how much space is needed. Remember to account for the extra room you will need for packing materials. Items consumer more space when they are wrapped properly in boxes, bubble wrap, and other materials. When you are researching Bay Area pod storage, you might ask for assistance in determining how much storage each unit offers. Once you know how much room you need, remember to pack your possessions strategically. Heavier and sturdier items should be placed on the bottom, and fragile items require proper buffering and positioning. You can do much to prevent overwhelm when moving. Take advantage of the resources available, including self storage units. 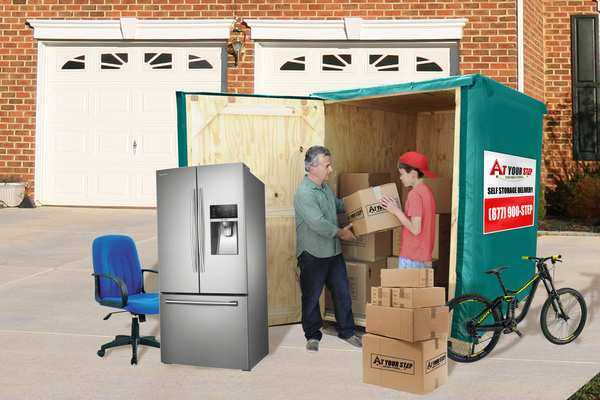 At Your Step Storage offers SF Bay Area self storage solutions to make every move easier. Call us today at (877) 900-STEP (7837), or request a free quote online.